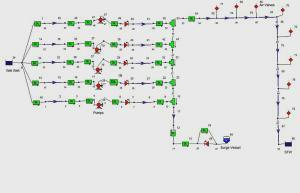 The figure on the left shows a simple Flowmaster network of a foul water pumping station, pumping to a treatment plant 10km away. The usual starting point for this and most hydraulic studies is to carry out a series of steady state analysis modelling the various flow scenarios. Flow systems are not always steady state for instance when a pump starts or a valve opens the flow will change and the system has a transient response. However for many systems the transient response is not significant and so can be ignored. The theory of flow in pipes and open channels is well documented. For a simple pipe system the analysis is relatively straightforward and the equations can be easily solved using a spreadsheet. For more complex systems such as networks a number of simultaneous equations need to be solved making a solution more difficult to find. Today there are a number of software tools designed to solve these flow problems such as Flowmaster and Wanda. A flow analysis can only be as accurate as the model that is used. Errors usually occur in modelling fittings such as bends, tees, non-standard components and in determining appropriate roughness factors. Getting the model right and knowing that the results are correct comes with experience. Analysing the behaviour of pre designed systems may only confirm what you already know. At Fluid Mechanics we have the necessary experience to offer a lot more. For new systems we can assist in the design process, providing recommendations on system design and control, optimise pipe and fitting sizing, provide performance specifications for pumps and valves and assist in supplier selection. For existing systems we can assist in identification of problems and recommend solutions or improvements, for example how energy consumption can be reduced.